JZ Contracting is a licensed and insured marine seawall contractor based in Fenton, Michigan. Our goal at JZ Contracting is to give our customers a very high quality product and service at a reasonable price. 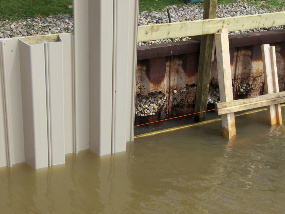 The majority of our projects are new vinyl seawalls that will last a lifetime with no maintenance required. 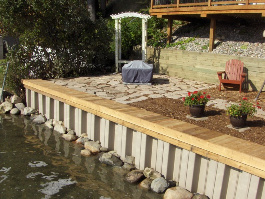 Many of our customers decide to add a new deck area around their new seawall that adds scenic enjoyment to their waterfront property. When deciding to have a new seawall built there are many different construction methods and materials that can be used. Each and every material used in the industry can produce a very nice looking sea wall. The difference comes with the price and the length of time the sea wall is expected to last. We at JZ Contracting believe that vinyl is the best product material for a sea wall that will last a lifetime. We have a saying around here that “VINYL IS FINAL.” With that being said, we must add that any sea wall is only as good as the contractor and material used. Steel sea walls have always been considered the very strongest sea walls around, but again depending on the thickness of the steel it can be inferior then some of the new vinyl products. Additionally, steel only has a 20 year life expectancy and the price is generally going to be higher. Another material used for sea wall construction is tongue-and-groove marine lumber. This material can give a homeowner a very beautiful sea wall at a lower price than the vinyl or steel. With that being said, however, it will not hold up over a lifetime. The maximum life expectancy of a wood seawall is only 15 years. Another very beautiful, natural way to build a seawall is using boulders. This again can save a property owner some expense, but will still require some maintenance in the future where erosion will occur. For a free estimate and a professional opinion on what type of sea wall best suits your needs please contact us.